When Jason Bergmann started warming up in the bullpen, Joel Hanrahan had already set the fire. The Question: would Our Number 38 be able to extinguish his very own flames? Staked to a slim one run lead and called on for the second consecutive day to close a victory out, "The Most Thrilling Closer In The Game--The Next Generation" was now in deep trouble--again. A leadoff walk allowed to Matt Diaz, a double to Jordan Schafer. The flames had been stoked in the top of the 9th. Those left in the announced crowd of 15,439 were rightfully worried about the outcome. Atlanta Braves' runners were on 2nd and 3rd, nobody was out. Our Fireman just needed to perform his duty--whether it was self-inflicted or not. 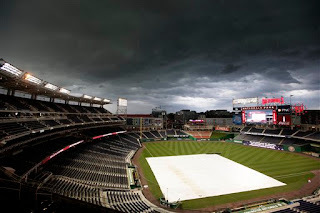 You had to believe the faithful still on hand at Nationals Park were praying that the earlier rains this evening in D.C. would return. The downpours which delayed tonight's affair for the second consecutive day. A 61 Minute later than expected start, this time, which soaked the playing field. A drenching which Joel Hanrahan needed to find and put out The Atlanta Braves Offense. 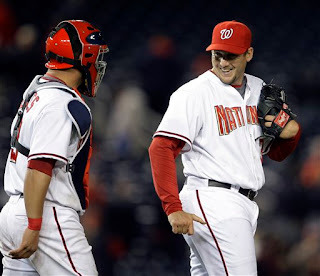 For the over three years that Hanrahan's Predecessor, Chad Cordero, held the job as Closer for Our Washington Nationals, The Atlanta Braves were his nemesis. "The Chief Cardiologist" suffered setback after setback at the hands of The Tomahawk Choppers. It didn't matter who Atlanta sent to the plate against Our Former Number 32, The Braves Lineup more times than not--fired away on "The Chief". Andruw Jones, Chipper Jones, Brian McCann and Jeff Francouer--Whomever. Atlanta seemingly had Chad Cordero's number. Hanrahan now found himself in a similar situation and with a new cast of characters to face. 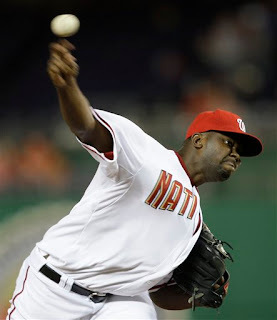 He was in serious trouble and The Atlanta Braves were again taking advantage of Our New Closer. As the crowd murmured, a few yelled their insults and as Jason Bergmann quickly tried to get ready--Joel attempted to regain his composure. Not wanting to blow another save, he slowly walked to the back of the pitching mound to compose himself as Atlanta's Manager Bobby Cox sent lefthanded pinch hitter Greg Norton to the plate. Hanrahan knowing--he had no margin for error anymore. The score was only 4-3 Washington and even a simple single might score the tying and go ahead runs. Realizing this crucial moment in time in his still young closing career was at hand, Hanrahan seemed to grasp that importance. Another blown save would again demoralize Our Team, Our Coaches and especially Our Fan Base. No one wanted to see the 4th 9th inning turnaround of the current homestand. What everybody wanted to see was A STOPPER. A Fireman that can put out all flames and relish in the role. Mostly staying away from his fastball, Joel used his slider and got Norton to ground out meekly back to the box. Hanrahan to Nick Johnson for out number one. A nervous sigh of relief from those still remaining on South Capitol Street. Damage control now fully in the works when Joel then proceeded to get Kelly Johnson to pop softly to Elijah Dukes in centerfield for out number two. On the verge of burning down the house, Our Number 38 had smoldered the fire. Could he finally put out the burning embers? Hanrahan was up to the task. With not a single drop of rain falling at Nationals Park, Joel Hanrahan now found himself needing to hose down the young and very dangerous Yunel Escobar. The promising young Atlanta Shortstop who hits with power and who consistently has beaten Our Washington Nationals over the past two seasons. No, it's never easier in The Big Leagues. And it's should never be. But if you want to be a closer, you better handle pressure well. And if you can harness that tension to your advantage, you are going to pitch with confidence. Not messing around, Joel Hanrahan looked in for the sign from his catcher Jesus Flores. This time there would be no slider. Our Number 38 was going with heat. Fire, to put out a fire. A winning combination when Yunel Escobar swung at Hanrahan's very first 94MPH offering. A fastball that extinguished the final opportunity for The Atlanta Braves tonight. A resultant simple ground out to Anderson Hernandez at second. A retiring of the side that immediately saw Joel Hanrahan pump his right fist up in jubilation, followed by a slapping of his right hand into his left glove hand. As his catcher, Jesus Flores, met him halfway between home plate and the pitching mound in celebration, Joel must have realized that you can survive a fire, if you keep your wits about you and your emotions in check. Far more than extinguishing a late rally this evening by The Atlanta Braves, Joel Hanrahan had fought back fear. And he didn't waver when the pressure was truly on. For the first time all season, Our Number 38 Really Looked Like A Closer. Final score from Nationals Park where The Home Squad won their second consecutive game of 2009, Our Washington Nationals 4 and The Atlanta Braves 3. The Bang!! Zoom!! Of The Fireworks!! signaling, yes--you can save a burning house, if you learn to keep your heartbeat under control. Yes, there was far more to this game than the 9th inning, including a terrific comeback from a three run deficit by Washington. But none of that would be remembered if Joel Hanrahan had not finally played Fireman. Thanks to a another throwing error by Alberto Gonzalez in the very first inning, Shairon Martis' rough first inning got even worse. All with two outs, Martis walked Chipper Jones and Brian McCann then allowed an rbi double to Casey Kotchman. But just when you thought The Braves would only score one run in the first, Gonzalez threw away an infield single off the bat of Jeff Francouer which allowed both McCann and Kotchman to score. Down three runs early, Shairon was in big trouble, but he settled down nicely and walked off the mound as the winning pitcher of record after six innings of work. Martis tends to nibble a little too much, allowed four walks and six hits this evening. But he really wasn't hit that hard. This was one of those hanging in there sort of games. Martis wasn't great, but he did pitch well enough to get his 2nd victory of 2009. Mike Hinckley pitched an effective 1.2 innings and was relieved by Julian Tavarez who retired Francouer on a fielder's choice to end the 8th, before Hanrahan was sent to finish this game out. 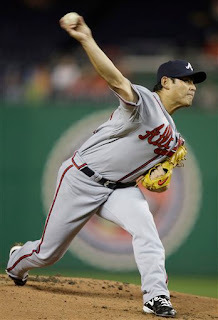 If you took Atlanta Starter Kenshin Kawakami put a Boston Red Sox Uniform on him, you would believe he was his Japanese Countryman Daisuke Matzsusaka. Same body type, same pitching mechanics. Almost frightening, until you realize Kawakami is no Daisuke. No, not by a long shot. Down 3-1 in the bottom of the 6th, Washington staged a serious comeback jump started by another launched rocket off the bat of Adam Dunn. The man who continues to lead The National League in On Base Percentage, deposited a Kawakami Fastball well over the centerfield fence for his 4th Home Run of 2009. A Crowd Pleaser that had the faithful up and roaring some more when Elijah Dukes followed with a screaming liner to the left of Chipper Jones at third base. A hot potato he couldn't handle and was charged an error. A mistake that was also not ruled an error when Matt Diaz butchered a line drive off the bat of Austin Kearns in left. A short hopped baseball on wet grass that skimmed under Diaz's glove and all the way to wall. Just like that this game was tied at three and Austin Kearns was standing on 3rd base with a ruled rbi triple. A new ball game that got even better when Josh Willingham, sent to the plate by Our Manager Manny Acta to pinch hit for Martis, smashed a Jeff Bennett fastball through the hole between 2nd and 3rd for, what turned out to be, the game winning rbi single. Do you think we can find a way to get Willingham some more At-Bats? He really does swing a nice stick at the plate. It was nice watching a comeback win. For a while it looked like the offense would never get untracked. But what Washington has proven in the first 13 games of 2009 is that they can score some runs. When Washington scored their first run of the evening in the 2nd inning, Elijah Dukes ran them out of scoring two. With nobody out, Dukes on second base after a hustling double stroked to right center and Austin Kearns at the plate--Elijah inexplicably took off trying to steal third. He was out by a mile. Like why? There were no outs? And his poor judgment on the basepaths hurt Washington when Kearns subsequently walked and scored on a ripped double to left off the bat of Jesus Flores. Dukes would have scored easily, but he had taken that opportunity away--unnecessarily. Later in the 8th, when Washington was looking to score an insurance run, Alberto Gonzalez was on third base with one out. With the Atlanta infield drawn in, pinch hitter Ronnie Belliard smoked a one hopper right at The Braves shortstop Yunel Escobar. For whatever reason, Alberto ran home and was also out by a mile. Again--like why? It's little mistakes, running yourself into outs that consistently prove costly in close games. Fortunately, Our Washington Nationals were able to overcome these errors in judgment. In the top of the 5th, Anderson Hernandez absolutely drilled a deep liner to right center. The Braves Centerfielder, Jordan Schafer ran hard, to his left into the gap. Reaching out his glove at the last second, crossing his right hand, his glove hand over his body--Schafer made a stunningly beautiful catch. Easily, The Defensive Play Of This Game. It was really nice. In fact, in the first few weeks of 2009, Schafer has proven to be a quality outfielder. April 21st was the first Tee-Shirt Tuesday of 2009, handed out to the first 10,000 fans a very nice red NatsTown Tee. Pretty good quality too with "Get Your Red On" emblazoned across the back. Of course catching Usher Charles actually working (we're kidding) worth the moment to capture this photo of him carrying a box of NatsTown Tees. And on the main concourse near home plate and The Washington Suites this evening, Exxon Mobil was on hand partnering with The PATH Malaria Vaccine Initiative (funded by The Bill & Melinda Gates Foundation) to accelerate the development of malaria vaccines in African Counties. Being from West Africa--The African Queen took a special interest in this community outreach program and visited with those on hand for a while--discussing the work. In the 4th inning Geico Presidents Race, The Washington Capitals Mascot, Slapshot, was on hand to participate. And in his honor, The Rushmores all raced with Hockey Sticks. Of course that didn't help Teddy, he didn't win again. George taking the honors easily. Finally, an employee who works at Nationals Park informed us before the game that someone wanted to meet us and say hello. A little while later we were introduced to Jeff Zimmermann (Jordan Zimmermann's Father) and his first cousin--Bryan. Stunned, The African Queen and I were to find out that Jeff and his Mom (Jordan's GrandMother) were regular readers of Nats320. For the entire game this evening at Nationals Park, Jeff and Bryan sat with us in Section 218. And later we introduced them to Hall Of Famer Don Sutton after the game. Mr. Zimmermann mighty proud that Don Sutton personally told him how impressed he was with Jordan Zimmermann's performance on Monday Night at Nationals Park. They talked for a while. Don Sutton telling Jeff Zimmermann the great skill and ability he witnessed in his son's work. It was a very nice moment. Don very happy to meet Mr. Zimmermann and vice versa. Sohna very happy to see her buddy, Don Sutton. Upon seeing her, Don exclaims: "Hey, Queen I still follow you two on the blog." Don also chatting with Sohna and I for a bit. It was nice seeing him again. "Not messing around, Joel Hanrahan looked in for the sign from his catcher Jesus Flores. This time there would be no slider. Our Number 38 was going with heat." SBF, since you were at the game you probably missed this bit of info that came out in the post-game wrapup on MASN. When Hanrahan looked in at Flores for the sign then, there wasn't one. Why? Because in the mound conference right before, they had agreed that he'd throw the slider. Yet Hanrahan came with the heat, without warning his catcher. He's extremely lucky that ball was hit, because otherwise it would have been wild pitch, tying run in, winning run on third. After learning this, I have to echo Charlie Slowes's words. What was he doing? What was he thinking? Thanks to both of you for showing the Zimmerman family such a good time at our park. Meeting Don Sutton on top of that, how cool! The entire family made our rain delays a delight on the first base side of the concourse, and we look forward to them coming back to see us. Not to mention looking forward to Jordan's next start at home. Great thunderstorm approaching shot, and Charles running the show at the t-shirt give away! Our Fireman just need to perform his duty--whether it was self-inflicted or not.Well said and you took the words right out of my mouth. Also, that was reminiscient of some of the adventures of The Chief as he would make it interesting and exciting on the circuitous route to a Save! Also enjoyed the JZimmermann family story. Very nice! It is touching to hear of family support like that (and friends too). ABM-I watched the Manny Acta news conference and if I can quote Manny correctly he said if [Hanrahan's fast ball] wasn't hit it may have taken Flores head off. I think it was a 95MPH fastball but looked outside and low to me and agree with you that it would have been a wild pitch. Who knows, in the end an exciting WIN!!! ABM - Technology is great. I just watched the replay of the last pitch and did a freeze frame as the ball met the bat. Flores was set up way outside and low and the pitch came in straight towards the mid-outside corner. It looked to me like if the batter didn't hit the ball it would have hit Flores square in the left shoulder. Chalk it up to better being lucky than good! The Nats advertised T-shirts to 1st 20,000 fans. When was 20,000 reduced to 10,000. Truth in advertising? Man, what a comprehensive report! We all really appreciate the time and effort you put into this blog. I'm thrilled with Martis! He just looks so solid, calm, and professional. I think the whole thing is coming together. Anonymous at 12:41--Tee Shirt Tuesday's have always been first 10,000 Fans, never 20,000. 20,000 is the number for The Los Nacionales Tee Shirt being given away on May 2nd. Read the promotion schedule, the numbers are clearly stated. Did the Zimmermann's scoop up any discarded tickets from the historic night?